Article by FETC 2018 speaker, Randy Ziegenfuss will present six sessions including “Our Greatest Untapped Resource: #StuVoice” and “Generation Z: It’s Complicated!“. For more information on his sessions, visit the FETC website here. Today’s Kindergarten students will be graduating in 2030! How will exponential changes in technology influence changes in teaching and learning? How can we shape the future instead of being shaped by it? Why is a future focus critical? As we think about transformation of the education system that includes exponential technologies, it’s important that we scan the current landscape but also “patrol the border between now and next” to best understand the changes that will likely disrupt our world as we know it, including the way we educate and learn using technologies. Remind them that our children five years of age and under will graduate in the early 2030s. And then ask them to imagine what the world will be like 15-20 years into the future. Ask them to go back 15-20 years and notice how much our lives have changed – how jobs and the economy have shifted; how the earth’s population is faced with grand global challenges connected to food, water, climate change and education (these will need solutions); how technology has allowed us to personalize so much of our lives; and how certain skills have become most valuable as we swim in a sea of both credible and not-so-credible information. Then ask your fellow educators if they think our primary/secondary education system is preparing learners well enough for that imagined future. Are we playing the “long game” in education? Or are we ignoring the future – the work of significance – and prioritizing work of “urgency” such as test prep, archaic teacher evaluation systems, ranking schools based on test scores and technology use that reinforces system efficiency but rarely leads to transformation? What might we be missing that can help us focus on the long game – focus on preparing today’s learners for a VUCA world – one that is (and will continue to be) volatile, uncertain, complex and ambiguous? We’re missing a vision that extends into the future – a compelling vision for learning that will best prepare our learners for the world of the 2030s and beyond. Simultaneously preparing for and shaping the future is not easy! It’s heavy lifting for leaders to listen to the voices of stakeholders and share data on the current trends and signals coming from society. It’s not easy managing the distractions of the short game while preparing our organizations – and our children – for the long game of career, civics and success in a world transformed by exponentially shifting technologies. What knowledge, skills and dispositions will our learners need for a successful future, whether graduating in 2018 or 2030? What should the learning environment look like (including the use of technologies) for our learners to successfully develop these competencies? 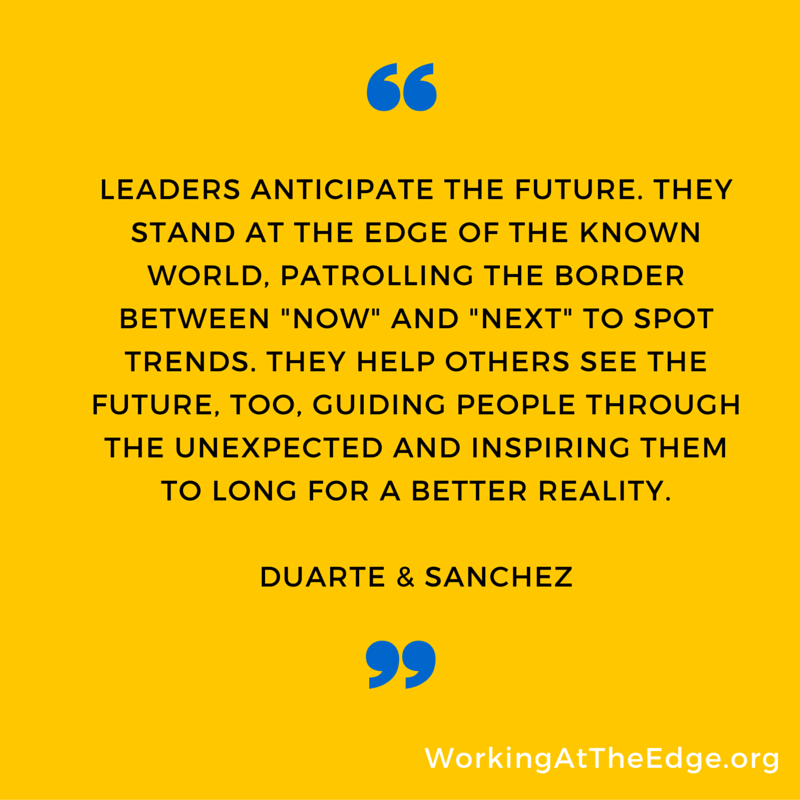 How can leaders patrol the border between now and next? As our leadership team answers these questions, implementing and iterating processes to bring our vision to life, we need to constantly “patrol the border between now and next” to ensure our work is preparing all learners for success in life. Here are some strategies we’ve used or plan to use to keep us future focused. Access resources to expand understanding of what is currently happening in the world with exponential technologies (AI, VR, internet of things, etc.) and career/economic trends. This sampling of resources has been effective at gently pushing against the sometimes-dominant ways of thinking about teaching, learning and how we use technology. Take the conversation and thinking about the future deeper. We have found the resources at KnowledgeWorks and GettingSmart to be particularly effective at shaping the conversation in the primary/secondary education space. KnowledgeWorks. The Future of Learning: Education in the Era of Partners in Code (Forecast 4.0) has been particularly good at defining potential implications for exponential technologies on learning and the K12 system. Also check out Shaping the Future of Learning: Strategies for Education Innovators and Leaders. Lots here to inform leadership for transformation! Their most recent paper, The Future of Learning: Redefining Readiness from the Inside Out is also a must-read. We’ve found KnowledgeWorks and their resources immensely helpful in making sense of current signals and their impact on the domain of education. GettingSmart – The #AskAboutAI ongoing series has been valuable in making connections between current educational technology trends, economic shifts and primary/secondary education. Recent articles: Artificial Intelligence in Education: Where it’s at, Where it’s headed; Artificial Intelligence in Education: Don’t Ignore It, Harness It; and Staying Ahead of the Robots: What Grads Should Know and Be Able to Do. Additional resources: We’ve been curating resources related to futures thinking that you might wish to access at this link. What resources or research have you found helpful and would add to the list? After building thinking around the “long game,” put that knowledge to use! I have had success using the Futures Wheel. The purpose of the Futures Wheel activity is to identify the long-term implications (both positive and negative) of a likely trend or technological development on education, learning and adjacent spaces. Having used this with teacher leaders, it is an effective activity to begin developing deeper understanding from the knowledge in Levels 1 and 2. Create the possible future for your learners! After all, we can choose to be victims of the future, having it done to us, or exercise agency, imagining a probably future and taking the necessary steps to create it with and for our learners. Singularity University has developed a detailed process that merges science fiction and design thinking – SciFi D.I. I recently had the opportunity to work through the process for the first time at a Re[solve] Learning program. Based on your discovery of trends (could be Levels 1, 2 and 3 above), what circumstances will likely exist in your imagined future? Create a persona of a learner in this future world. Define key concepts/opportunities that exist for creating this future. Retrocast – work backwards to today, defining key activities and milestones that will make the designed future a reality. There are many different ways to approach designing the future of learning with exponential technologies using the SciFi D.I. framework. What will learning, teaching and leading look like? How will school “systems” look different? It’s easy to be distracted by the urgent and important in the daily work of being a school leader. Leaders must push beyond the urgent and important orbits, spending more time and resources on work of significance. The work of significance, among other things, includes designing a compelling future vision for learning in a world rich with technology. Being future focused is no longer an option if we are committed to preparing all learners for success in the world today, in 2030, and beyond. Will you shape the future? Or be shaped by it? Follow Randy Ziegenfuss on Twitter.